Prairie Mining Limited #PDZ notes the recent press articles regarding possible co-operation between the Company and Jastrzębska Spółka Węglowa SA (“JSW”) to progress the development and exploitation of the Company’s Polish coal assets. Prairie confirms that a meeting was held with JSW where preliminary discussions regarding co-operation took place. Discussions are at a very early stage and there can be no certainty as to whether any co-operation will be agreed. 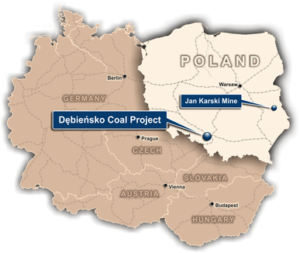 The Debiensko Mine (“Debiensko”) is a fully permitted, hard coking coal project located in the Upper Silesian Coal Basin in the south west of the Republic of Poland. It is approximately 40 km from the city of Katowice and 40 km from the Czech Republic. In October 2016, Prairie (“Prairie” or “Company”) acquired Debiensko with a view that a revised development approach would potentially allow for the early mining of profitable premium hard coking coal seams, whilst minimising upfront capital costs. Prairie has proven expertise in defining commercially robust projects and applying international standards in Poland. The fact that Debiensko is a former operating mine and its proximity to two neighbouring coking coal producers in the same geological setting, reaffirms the significant potential to successfully bring Debiensko back into operation. Prairie notes that on 11 December 2017, the Polish government appointed a new Prime Minister, Mr Mateusz Morawiecki, who immediately prior to his current role, was Deputy Prime Minister and Minister of Development and Finance in Poland. Prairie also notes that on the 9 January 2018, a new Minister of Environment, Mr Henryk Kowalczyk, was appointed as part of a cabinet reshuffle under the new Prime Minister. In Poland, responsibility for exploration and mining concessions is the responsibility of the Ministry of Environment. Following his appointment, Prime Minister Mateusz Morawiecki, presented the Polish Ministry of Development’s “Program for Silesia” (“Program”) – a strategic document which anticipated the re-construction of a coking coal mine in the region of Upper Silesia, where Debiensko is located. The Program details the creation of 1,500 direct jobs in the region and indicates the social and economic benefits of re-construction of a coking coal mine, and to potentially be funded by foreign and Polish capital. Following completion of a 28 shallow geo-technical drill program in the previous quarter, Prairie continued to analyse the drill hole data which will be used for engineering design of foundations of structures associated with the shafts, coal handling and preparation plant (“CHPP”) and other surface facilities. These holes are essential in order to assess the soil conditions, properly design structural foundations and thus provide more accurate pricing in the tenders as required for a feasibility study. Demolition works continued throughout the quarter specifically targeting old structures including walkways and old administrative buildings. To date, Prairie has completed demolition works on a number of old surface structures of the former Debiensko mine including the bathhouse, switchgear building and locomotive garage. Through the acquisition of Debiensko in 2016, Prairie obtained land tenements within the village of Kaczyce which were considered non-core to the construction, restart and operations of the Debiensko Mine. During the quarter, the Company agreed the sale of the non-core land for consideration of PLN1.4 million (~A$500,000). Prairie has received the consideration and ownership of the land is expected to be transferred by the end of the next quarter. An application for issuing the environmental decision together with the Environmental and Social Impact Assessment (“ESIA”) was submitted to the Regional Director for Environmental Protection (“RDOS”) in Lublin in October 2017. Taking into account the RDOS’s additional comments the motion and ESIA were supplemented in late November 2017. The Environmental Consent process has now officially been initiated by RDOS. Prairie is now waiting for approval of the ESIA in the form of an Environmental Consent decision, which is the last component to meet all formal requirements to apply for the Mining Concession for construction for the Jan Karski Mine (“Jan Karski”). In November 2017, the Company hosted a delegation in Poland including China Coal No.5 Construction Company Ltd (“China Coal”) and the Chinese Government’s officially authorised coal mine design institute Jinan Mine Design Institute, during which locally provided content for construction of Jan Karski was finalised alongside domestic Polish specialists, subcontractors and partners who will provide relevant Polish content. China Coal’s technical studies for the construction and funding of the Jan Karski Mine have significantly advanced and Prairie is currently reviewing study documents (“Studies”) received from China Coal subsequent to the quarter end. In accordance with the Strategic Co-operation Agreement between Prairie and China Coal, the Studies will form the basis for provision of debt financing out of China for the construction and development of Jan Karski. The Studies are being undertaken in accordance with Chinese official mine design and banking standards for coal mine projects, and to comply with domestic Polish engineering standards and standards for mechanical and electrical equipment. The terms of the Environmental Consent and Mining Concession for Jan Karski will be incorporated into the final engineering design, as well as results from the latest coal quality and hydrogeological drilling works being conducted by the Company. Prairie and China Coal continue to advance discussions with Chinese banks to provide debt facilities to fund construction of the Project and enter into a complete Engineering, Procurement, and Construction (“EPC”) contract under which China Coal would construct the Jan Karski Mine. Prairie has cash reserves of A$15.1 million. With CD Capital’s right to invest a further A$68 million as a cornerstone investor, plus with the Strategic Co-operation Agreement Prairie has with China Coal for financing and construction of Jan Karski, Prairie is in a strong financial position to progress with its planned development activities at Debiensko and Jan Karski. * On 1 July 2015, the Company announced that it had secured the Exclusive Right to apply for a mining concession for Jan Karski. As a result of its geological documentation for the Jan Karski deposit being approved, Prairie is currently the only entity that can lodge a Mining Concession application over Jan Karski within a three (3) year period up and until April 2018. In addition, Prairie has the right to apply for and be granted a mining usufruct agreement for an additional 12 month period that precludes any other parties being granted a licence over all or part of the Jan Karski concessions. Prairie applied for a mining usufruct agreement in December 2017. The approved geological documentation covers an area comprising of all four of the original exploration concessions granted to Prairie (K-4-5, K-6-7, K-8 and K-9) and includes the full extent of the targeted resources within the mine plan for Jan Karski. In this regard, no beneficial title interest has been surrendered by the Company when the K-6-7 exploration concession expired during the quarter. The Company intends to submit a mining concession application, over the mine plan area at Jan Karski (which includes K-6-7) within the next 12 months. Under Polish mining law, and owing to the Exclusive Right the Company has secured, Prairie is currently the only entity that may apply for and be granted a mining concession with respect to the K-6-7 area (the Exclusive Right also applies to the K-4-5, K-8 and K-9 areas of Jan Karski). There is no requirement for the Company to hold an exploration concession in order exercise the Exclusive Right and apply for a mining concession. ** Under the terms of the Debiensko Mining Concession issued in 2008 by the MoE (which is valid for 50 years from grant date), commencement of production was to occur by 1 January 2018. Not commencing production by January 2018 does not immediately infringe on the validity and expiry date of the current Mining Concession, which is June 2058. However, the concession authority has the right to request the concession holder to reasonably remove any infringements related to non-conformance with the conditions of a Mining Concession and determine a reasonable date for removal of the infringements (under Polish law, the concession authority is required to provide a reasonable timeframe to remedy any non-compliance taking into account the nature of the non-conformance). Failure to remedy the infringements within any reasonable time frame prescribed by the concession authority may lead to commencement of proceedings to limit or withdraw of a concession. In December 2016, the Company submitted an application to the MoE to amend the Debiensko Mining Concession to alter the date for commencement of production from 2018 to 2025, and has provided the MoE with additional information requested. A decision from the MoE is currently pending following a change in the Polish Prime Minister in December 2017 and the appointment of a new Minister of Environment in January 2018. 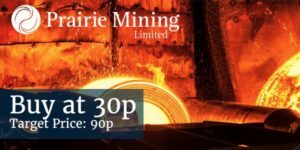 Prairie Mining Limited and its controlled entities provides information in accordance with London Stock Exchange Listing Rule DTR 4.3A in respect of payments made by the Company to governments for the year ended 30 June 2017 and in compliance with The Reports on Payments to Governments Regulations and its amendment in 2015. The following schedule details payments made to Polish government entities by its wholly owned Polish subsidiaries PD Co sp. z o.o. and Karbonia S.A. Further, due to the operational focus of the Group during the year ended 30 June 2017, the Polish government is the only relevant party to whom payments are made. This report is also available for download at www.pdz.com.au. The Debiensko Mine, is a fully permitted, hard coking coal project located in the Upper Silesian Coal Basin in the south west of the Republic of Poland. It is approximately 40 km from the city of Katowice and 40 km from the Czech Republic. The Debiensko mine was originally operated by various Polish mining companies until 2000 when mining operations were terminated due to a major government led restructuring of the coal sector caused by a downturn in global coal prices. In early 2006 New World Resources Plc acquired Debiensko and commenced planning for Debiensko to comply with Polish mining standards, with the aim of accessing and mining hard coking coal seams. In 2008, the Minister of Environment of Poland (“MoE”) granted a 50-year mine license for Debiensko. 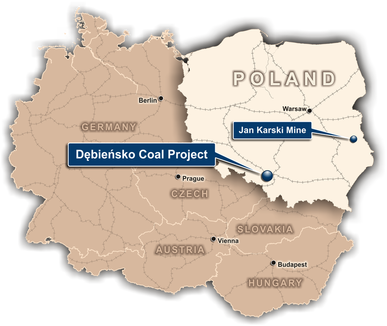 The Jan Karski Mine is a high-value ultra-low ash semi-soft coking coal project located in the Lublin Province in the south east of the Republic of Poland. In November 2017, Prairie submitted the Environmental and Social Impact Assessment (“ESIA”) for Jan Karski. Prairie is now waiting for approval of the ESIA in the form of an Environmental Consent decision, which is the last component to meet all formal requirements to apply for the Mining Concession for construction at Jan Karski. Independent environmental consultants have confirmed Prairie has met all pre-requisite requirements and can expect an environmental permit in due course. Prairie’s strategic partner, China Coal No.5 Construction Company Ltd, is set to complete all Technical and Economic Studies required and considered “bankable” by Chinese financing institutions. The studies will form the basis for provision of debt financing for the construction and development of Jan Karski. Upon completion of the Studies, Prairie and China Coal intend to seek Chinese bank credit approval to fund construction of Jan Karski and enter into a complete Engineering, Procurement, and Construction (“EPC”) contract under which China Coal will construct the Project. An Independent assessment by specialist coking coal market consultants predicts that the Jan Karski ultra-low ash SSCC would potentially realise a 10% premium to international benchmark prices. Preliminary discussions between Prairie and select European steel makers have confirmed the suitability of ultra-low ash SSCC to be utilised in coke oven blends. Consequently, the Company is currently updating the marketing and sales strategy for the coal which will be produced at Jan Karski and will incorporate this strategy into the Studies.